"Kind and patient, Greenfinger Zawan has spent many years among the Floran people in their jungles, and hopes for their continued survival." Greenfinger Zawan is a commander in the Floran Tribes. 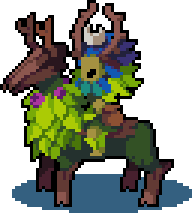 Each Floran tribe has a Greenfinger, who leads the tribe and offers direction, and Zawan is the Greenfinger of a Floran Tribe that inhabits the dense forests to the north of the Cherrystone Kingdom. Greenfinger Zawan is brave and wise; an experienced elder who rules the Floran with strength and compassion. 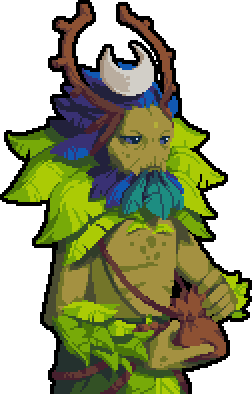 He has the ability to produce and manipulate plants at will by invoking the powers of nature - an ability uncommon even among the Floran. Not every Floran has the skills to be a Greenfinger. Though their abilities aren't necessarily inherited, they are innate. In every generation, a Floran with the potential to become a Greenfinger is born. Beyond their powers to manipulate plants, Greenfingers are also more level-headed and forward thinking than other Floran. It is these traits that are most important when it comes to governing their kin. Floran are fun-loving, easy-going, and unremittingly violent, so it takes a Greenfinger's guiding hand to keep them in check. Zawan trained to lead the Floran under the tutelage of the late Greenfinger Russom. Zawan was young when this training began; it doesn't take long for a sapling capable of becoming a Greenfinger to show themselves, being naturally attentive and studious in ways other Floran simply aren't. Zawan was taught all that Russom could impart: how to cajole wayward hunters into good behaviour; how to encourage a Floran's natural inquisitiveness towards informative learning; and how to channel the energy of their people into productive endeavours (rather than thoughtless violence). For 22 years Zawan was schooled in the way of the Greenfinger, but when Greenfinger Russom died at the age of 212, Zawan felt there was still much to learn. Despite these reservations, Greenfinger Zawan has excelled as a leader, and has fostered an era of safety and prosperity for the Floran of Aurania. Greenfinger's Groove is Wild Growth. The player chooses 5 tiles within the area/range and Vines (an immobile unit) spawn. Wild Growth is particularly useful in conjunction with ranged units that are able to use his vines for cover. During fog of war, the vines are also capable of Ambushing foes. The vines degrade over time at 1HP per turn, and can be attacked by enemy units without attacking themselves. Greenfinger is voiced by Sean Chiplock. This page was last modified on 24 March 2019, at 02:14.